Reviewing the game film from a Patriots game is always a good barometer to see how the team performed in a given game. After a 27-0 white-washing of an AFC playoff team, you can be sure that there was plenty of good execution by the offense, defense, and special teams to go around as it was a very impressive victory. Going back and watching the game a few times in the past two days, it was very apparent the Patriots had done their homework and were extremely well prepared for the task of facing Houston on a short week. The coaches studied the Texans’ tendencies and put together an excellent game plan. They put the players in a good position to win and the execution in many instances was flawless. Bill Belichick will no doubt have plenty of film that will show otherwise when the players have their meetings, but overall this was an excellent team win. We’ve picked out a couple of different plays this week and we’ll take a look at how the team did. 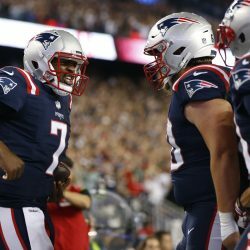 Jacoby Brissett 27-yard TD Run: What can you say about a rookie 3rd string QB who is pressed into service and gets the victory on a short week with just two walk-thru practices to prepare? He did an admirable job and while his numbers aren’t going to jump off a stats page, he did exactly what the team needed from him. And the first touchdown was a fantastic call by Josh McDaniels and perfectly executed all around. The Patriots align in “11 personnel” with three WRs, one TE, and one RB. 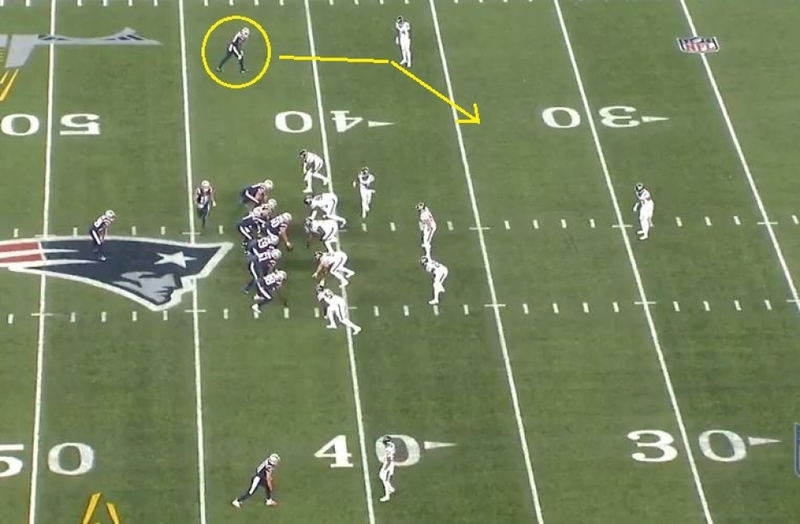 They’re showing a run to the left side with Martellus Bennett aligned just off the tackle, Julian Edelman in the slot and Chris Hogan out wide. Malcolm Mitchell is the sole WR aligned to the right of the formation. LeGarrette Blount is the lone RB aligned behind Brissett who is under center. The Patriots sell the run to the right with everyone on the left moving like Blount is running a sweep or over the left tackle. McDaniels pulled out a new play with QB option run here. 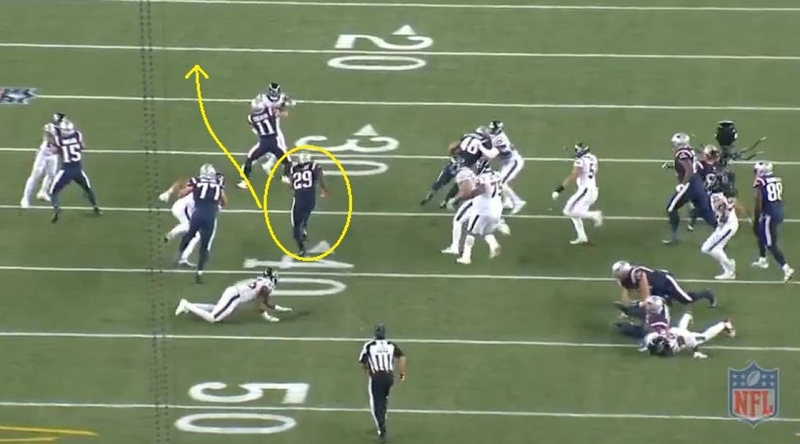 Brissett pulls the ball away from Blount and runs back against the grain to the right. 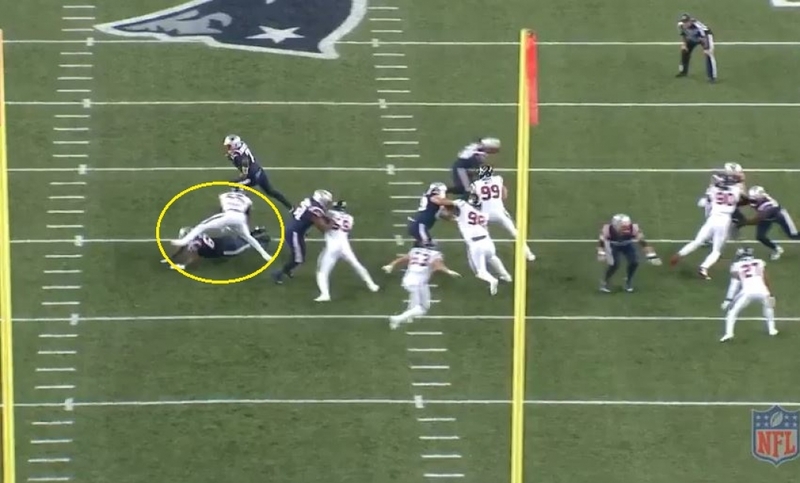 Houston was aggressive in trying to stuff the run, J.J. Watt shoots the gap between Joe Thuney and Nate Solder on the Pats left and would have been in excellent position to hit Blount in the backfield. Benadrick McKinney lined up as the left OLB, tries to shoot inside to run down the play from behind. ILB Max Bullough flows to the right and takes himself out of position. Marcus Cannon sees Whitney Merciless pushing inside to the right and rides him right out of the play, Shaq Mason pulls out and cuts McKinney, giving Brissett time to reach the edge. Once Brissett reaches the edge there is a ton of real estate for him to run, he eludes the safety Andre Hal at the five-yard line and Mitchell who was taking CB Jonathan Joseph with him deep down the field easily blocks him out of the play for the score. Joseph and Hal won’t want to review this play in the Houston film room. Malcolm Mitchell 27-Yard Reception: The Patriots rookie WR isn’t making a ton of grabs in the early going this year, but he’s making an impact when he does. 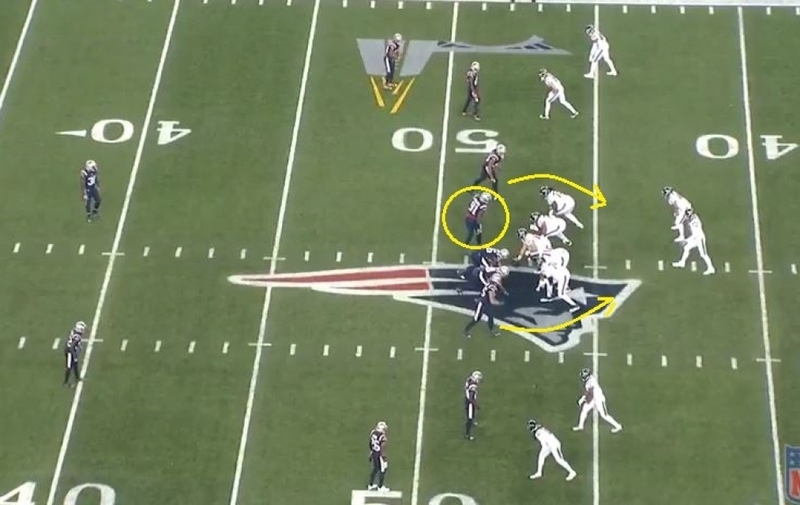 On this play in the first half, the Patriots are again in “11 personnel”, Mitchell is split wide left, Edelman wide right. Bennett is line up as an in-line tight end on the right side. Hogan comes in motion from left to right. James White is the lone back directly behind Brissett who is under center. Houston is showing pressure with five men aligned on the line of scrimmage with one deep safety. They’re playing off the receivers at the line which gives them a small cushion. At the snap, Mitchell runs a quick slant and gets inside position on Jonathan Joseph where Brissett gets him the ball quickly. Joseph whiffs on the tackle and Mitchell is off. In a poor show of tackling, SS Quentin Demps then misses as well and a simple 5-yard slant turns into a 27-yard gain. Good execution by the Patriots, poor play by the secondary of the Texans. 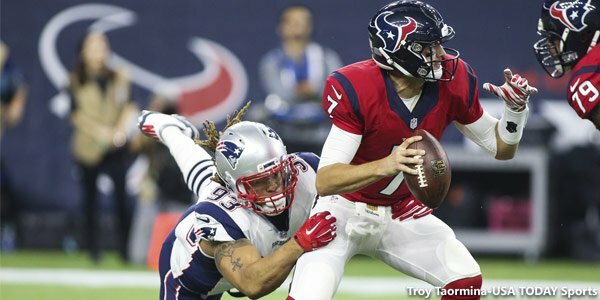 Jabaal Sheard Sack: Sheard had two sacks on the day but his first is a great example of what Chris Long has frequently stated as “playing team defense”. 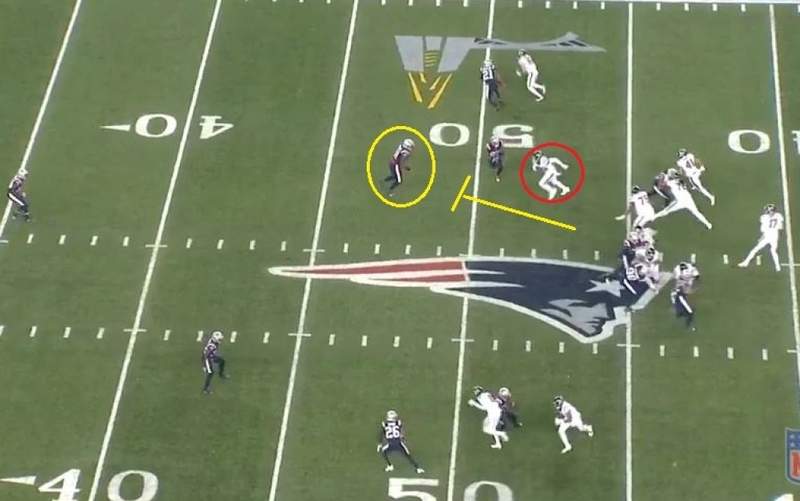 The play of Jamie Collins makes this play possible followed by a great individual effort by Sheard. Houston is lined up going four wide, with two receivers split wide and aligned closely on each side of the formation. Jonathan Grimes is the lone back and he’s on QB Brock Osweiler’s right side. The Patriots are matching up in man coverage outside. But at the line, New England only shows two interior down linemen. DEs Long, Sheard, and LB Jamie Collins all stand and are showing pressure. Houston brings Stephen Anderson in motion from right to left and as he gets to the line, the ball is snapped and he runs a slant, presumably into the middle of the field where they believe Collins is vacating. But Collins drops into coverage and is right in the window where Osweiler wants to go with the ball. Grimes tries to slip out into the right flat but gets caught up in the wash. Sheard puts an outside move on Derek Newton and beats him to the outside, where he flushes Osweiler and eventually gets enough of his shirt to throw him down. It is a good example where when all of the pieces are working in concert, good things happen. Collins movement forced Osweiler to hold the ball, just long enough for Sheard to reach him for the sack. Blount 41-yard Touchdown: The Patriots offensive line did a very good job of run blocking in this game, opening enough holes for the team to generate 185 yards on the ground. On the final scoring play of the night, they once again show some nice execution. The Patriots are lined up with their “21 personnel” package with 2 RBs, 2 WRs, and 1 TE. 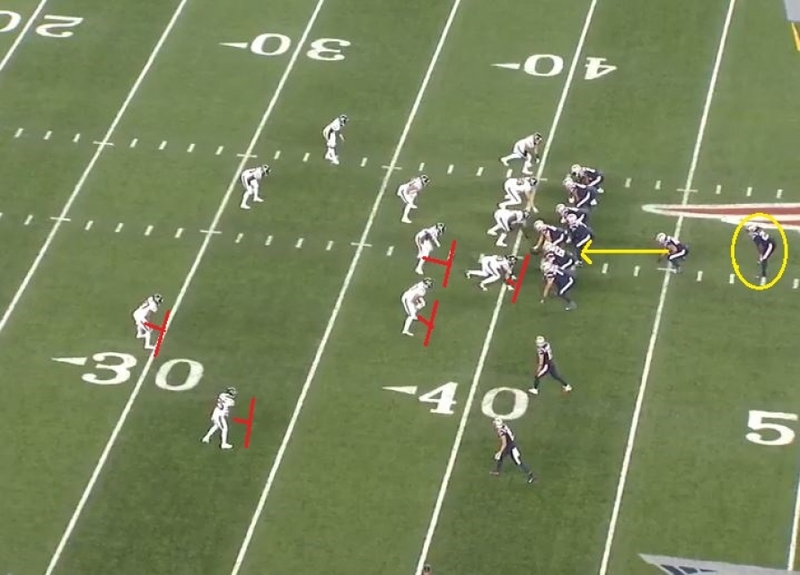 Edelman and Hogan are lined up wide right, Bennett is on the right side in-line. Blount is the deep back in the “I-formation” with James Develin as the fullback. Houston is expecting the run to the right and has a heavy formation package favoring the exact spot where New England want to run. 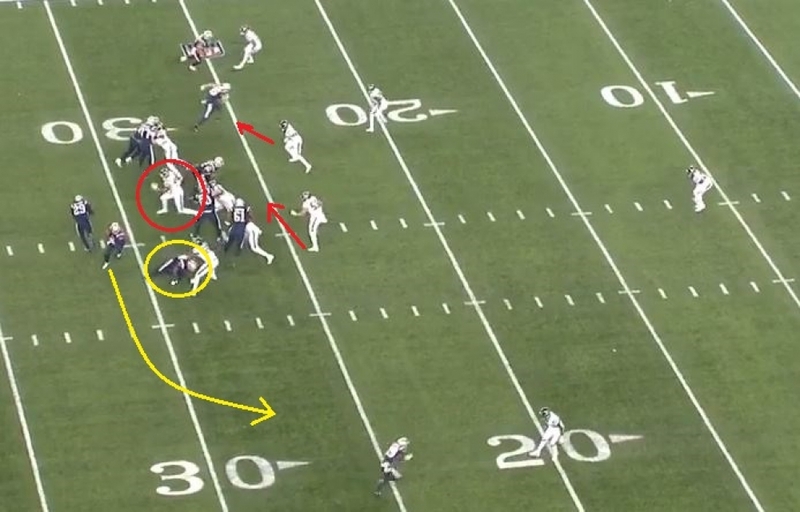 At the snap Nate Solder pushes Merciless to the outside, McKinney shoots the gap but can’t bring down Blount. Now the advantage goes to New England, they have the numbers and Blount has plenty of room to run. 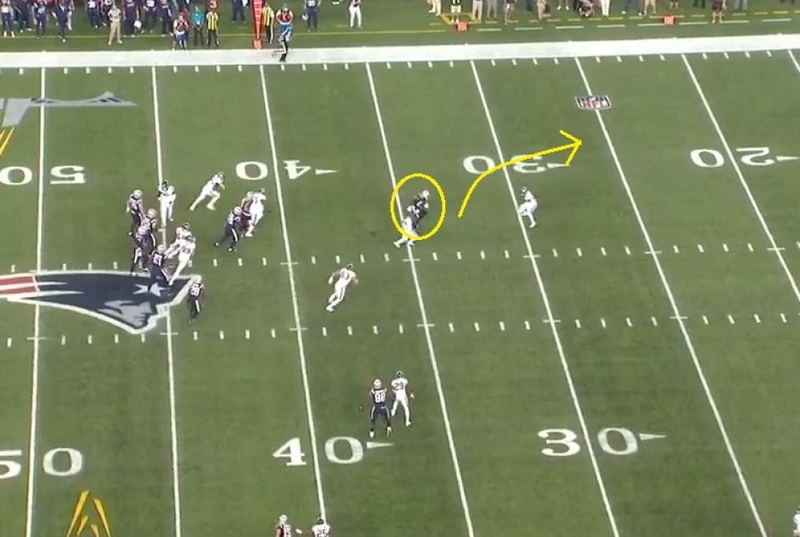 Develin gets downfield and seals off the backside pursuit. 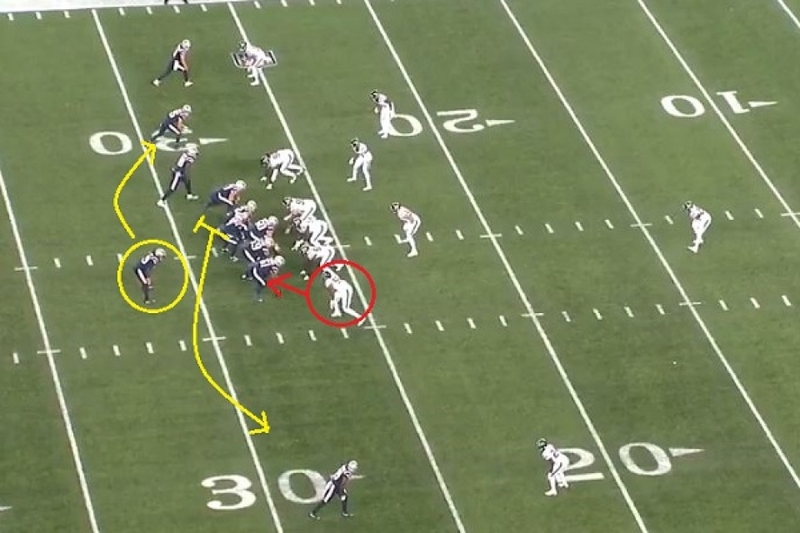 Hogan and Edelman do a great job of blocking downfield and seal off their men. 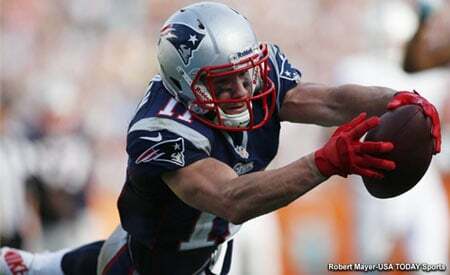 Edelman in particular pancakes SS Quentin Demps. Blount, once he gets up a head of steam isn’t an easy man to bring down and scores the easy TD. 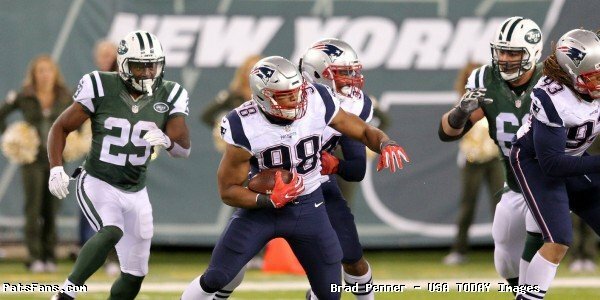 This entry was posted in Patriots Commentary, Patriots Film Room and tagged 2016 NFL Season, 2016 Patriots season, Bill Belichick, Brock Osweiler, Chris Hogan, Chris Long, Danny Amendola, Dont'a Hightower, Houston Texans, Jabaal Sheard, James Develin, Jamie Collins, JJ Watt, Julian Edelman, LaGarrette Blount, Nate Solder, New England Patriots, NFL, Patriots, Quentin Demps, Rob Gronkowski on September 24, 2016 by Steve Balestrieri. Bill O’Brien is a really good coach. And he’s surrounded himself with a very good staff and football team. They will no doubt be a playoff team in 2016 and will probably win their division again. But they, as a unit got taken to the woodshed on Thursday night by Bill Belichick and the Patriots as New England dominated in all four phases of the game, offense, defense, special teams and coaching in a 27-0 win on Thursday Night. 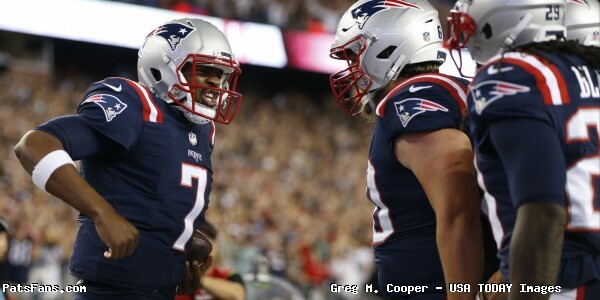 The Patriots were led by rookie QB Jacoby Brissett who ran for a 27-yard touchdown, LeGarrett Blount who turned in another 100-yard performance with a pair of touchdown runs, a fantastic performance by their special teams who caused two huge turnovers and a stifling defense, the Patriots improved to 3-0. New England came in short-handed and Houston was actually favored in this one. With Tom Brady, Rob Ninkovich, Dion Lewis, Dont’a Hightower out and Rob Gronkowski just easing his way back on the field, Houston saw an opportunity to wrest control of the AFC with a signature win. Even backup QB Jimmy Garoppolo was out with a shoulder injury, prompting 3rd string rookie Brissett to start his first game. Instead, the Texans fly back to Houston wondering what the heck happened again as they were smoked badly. Belichick on a very short week, came up with a masterful game plan that played to the strengths of his young QB and made his transition and throws easier. They leaned on their running game and veteran LeGarrette Blount. He also did what he always does, he took away Houston’s biggest weapons on offense and defense and forced you to beat him somewhere else with different players. After a near melt-down by the secondary on Sunday, all the hand-wringing over what the talented Houston wide receivers would do on Thursday went for naught. The Patriots played a two-deep safety look against the Texans, essentially bracketing their talented pair of WRs in DeAndre Hopkins and Will Fuller with the cornerbacks covering underneath and safeties over the top. As a result, the Texans penchant for throwing the ball deep was taken away right off the bat. The Patriots dared the Texans to run and then did a great job of stuffing them when they tried to take advantage. The defense frustrated and harassed QB Brock Osweiler who finished with the pedestrian numbers of 27 of 41 for 192 yards, 0 TDs, and 1 interception. Hopkins was blanketed by Logan Ryan all night and made just 4 catches for 56 yards. All of which were contested and forced him to make some acrobatic catches. Houston didn’t even enter Patriots territory until there were less than a minute and a half left in the third quarter. They never seriously threatened to score as the Pats, playing outstanding team defense, stymied and frustrated them time and again. On defense, J.J. Watt, Whitney Merciless, and Jadeveon Clowney were all relegated to a milk carton as they were missing all night. Houston’s best player on defense was former Patriot Vince Wilfork who was a force in run support. 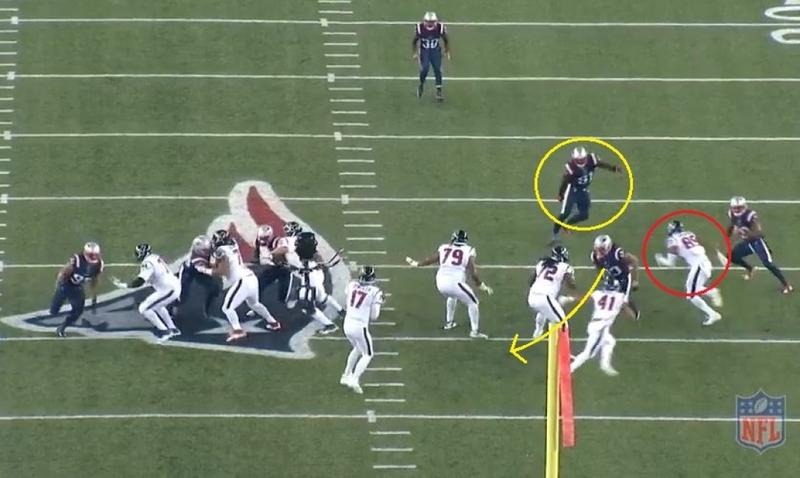 Houston’s STs, as we pointed out in our keys to the game, was a problem area and the Patriots exploited them causing two turnovers that turned into points. The first, after a Pats FG, came on the ensuing kickoff. Brandon Bolden ripped the ball loose from Charles James and Duron Harmon recovered. Brissett two plays later ran a bootleg around the right side as Watt crashed inside into thin air and the rookie waltzed in for a score to make it 10-0. Punter Ryan Allen had one of his best games in a Patriots uniform. He downed punts inside the Texans 15-yard yard line six times and averaged 47.2 yards per punt. O’Brien and Osweiler should have recognized what Belichick was doing to them defensively and opted to take the patient approach. There was room underneath for the Texans to work the ball to the tight ends and backs. They weren’t going to find any kind of room for those deep chunk passes down the field. But they continued to force the ball into tighter and tighter windows and Osweiler threw his fourth pick of the season. 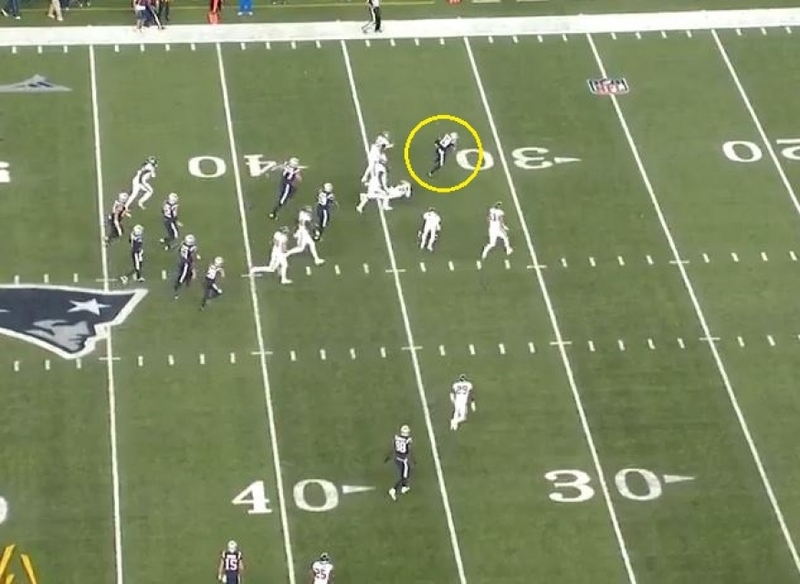 He tried to force a pass into double coverage and Jamie Collins picked him off for his second INT in two weeks. 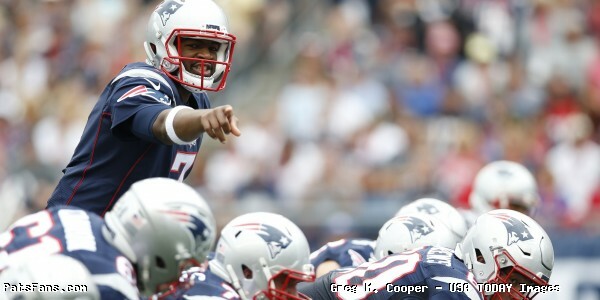 Brissett Does His Job: What can you say about the rookie QB’s baptism of fire on Thursday night? His passing numbers weren’t eye-popping, 11-19 for 103 yards, and added eight runs for 48 yards and a score but he did what the coaches asked of him. And most importantly he didn’t turn the ball over. He showed remarkable poise for a young player who got very little work during training camp and the preseason. 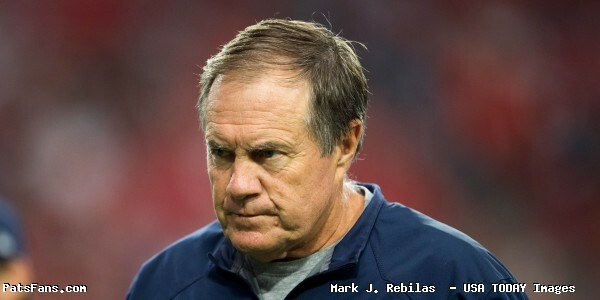 Belichick’s mantra to his young QB all week was don’t give the ball to them (Texans), keep it for us. So after his 27-yard touchdown run, Brissett wanted to show the coach he indeed was following the game plan and trotted off the field and promptly handed the ball to Belichick. The coach made sure that the ball found its way back to the QB. Blount Answers the Bell Again: Is there a guy happier to be in New England more so than the Patriots big running back? It is debatable. But just four days after carrying the rock 29 times against Miami, Blount carried it 24 more times for 105 yards and a pair of touchdowns. Just like Sunday, Blount’s runs in the first half didn’t net much in the way of yardage. He gained just 11-yards on seven rushes in the first 30 minutes. But those runs bear fruit in the second half. Houston’s defense is tough but not deep and the more Blount rushed, the better he got. His second half numbers, 17 carries for 94 yards and two scores. The second of which was a classic Blount breaking free and racing 41 yards to put the game away. In Brady’s Goodell-enforced absence, we thought the Patriots would lean on the running game and Blount to ease the onus on the QBs. Thru three games, Blount has carried the ball 75 times for 298 yards and four touchdowns. Mission accomplished. He’s earned himself some ice-tub time this weekend. This is the defense envisioned this summer: What a great overall performance by the Patriots defense. After an admittedly bad second half against Miami, they faced the team that throws the ball deep more than any other team. What did Houston do in the deep passing game? Nada, zilch, nothing. No chunk plays of 20+ yards downfield. The corners, Logan Ryan and Malcolm Butler contested everything and even when Osweiler completed a pass to Hopkins or Fuller, they were contested and there were zero yards after the catch. In our players to watch piece, we highlighted Jabaal Sheard and said he was due for a breakout game. He notched a pair of sacks and had his best overall game of the season. 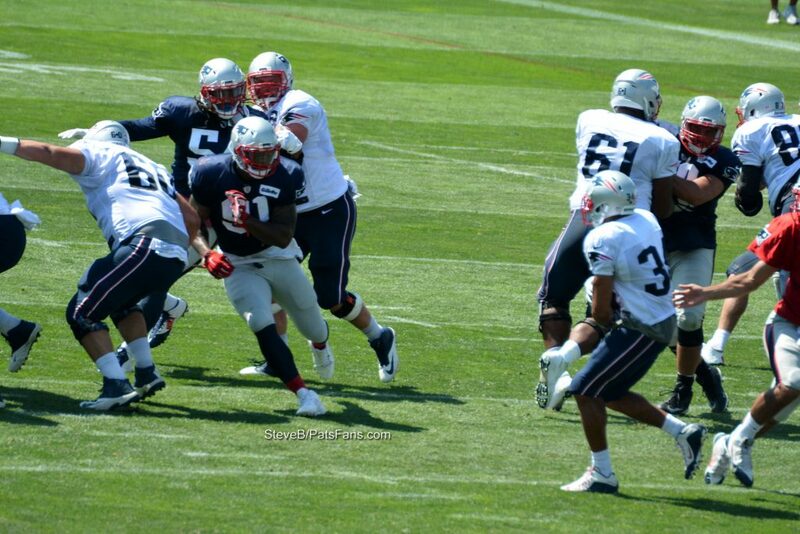 Jamie Collins had a tremendous effort as well even without Hightower beside him at linebacker. They limited RB Lamar Miller as he was really ineffective at key points of the game. He did end up with 80 yards but many came in garbage time when the outcome was no longer in doubt. Earlier this week, Michael Irvin from the NFL Network said that if the Patriots beat the Texans on Thursday night with their 3rd string QB that he’d change the names on his Lombardi Super Bowl trophies to Belichick. While a tad premature, maybe Irvin better get that engraver on speed dial. So the Patriots are (right now), the only 3-0 team in the NFL. They’ll enjoy this victory over the weekend and on Monday, get right back to work. Rex Ryan and the Bills come to town next weekend. We’re on to Buffalo. This entry was posted in Patriots Commentary, Patriots News and tagged 2016 NFL Season, 2016 Patriots season, Bill Belichick, Bill O'Brien, Brock Osweiler, Danny Amendola, DeAndre Hopkins, DeflateGate, Dion Lewis, Dont'a Hightower, Houston Texans, Jabaal Sheard, Jacoby Brissett, Jimmy Garoppolo, JJ Watt, Julian Edelman, LaGarrette Blount, Logan Ryan, Malcolm Butler, New England Patriots, NFL, Patriots, Patriots edge rushers, Rob Gronkowski, Rob Ninkovich, Tom Brady, Whitney Mercilus, Will Fuller on September 23, 2016 by Steve Balestrieri. The Patriots take the field in the second of a three-game home stand to face the Houston Texans on Thursday Night Football. There is no shortage of story lines to focus on the game as both teams enter the contest 2-0 and look to continue early season success. Not the least of which is who exactly will be quarterbacking the Patriots in Foxboro this week? 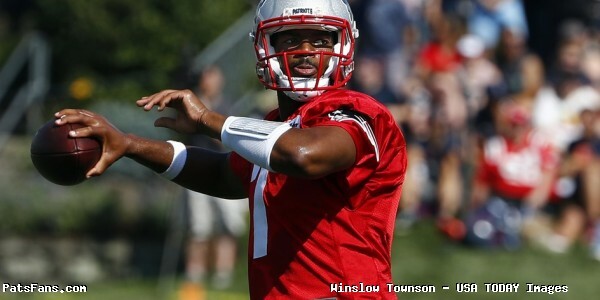 With Tom Brady suspended and Jimmy Garoppolo suffering a sprain of the AC joint in his throwing shoulder, it looks like rookie Jacoby Brissett will get his first NFL start just two weeks after Garoppolo had his. Houston has retooled a playoff team on the fly and added a number of good additions to their offense. But they’ve been winning with a stout, underrated and tough defense. Former Patriots coordinator Bill O’Brien is putting together a good team in Houston and they’re looking to take that next step. Of course, the NFL will unleash the latest in uniform abominations with their “Color Rush” scheme for New England in an attempt to hide the generally weak product that passes for NFL competitions on such a short week. 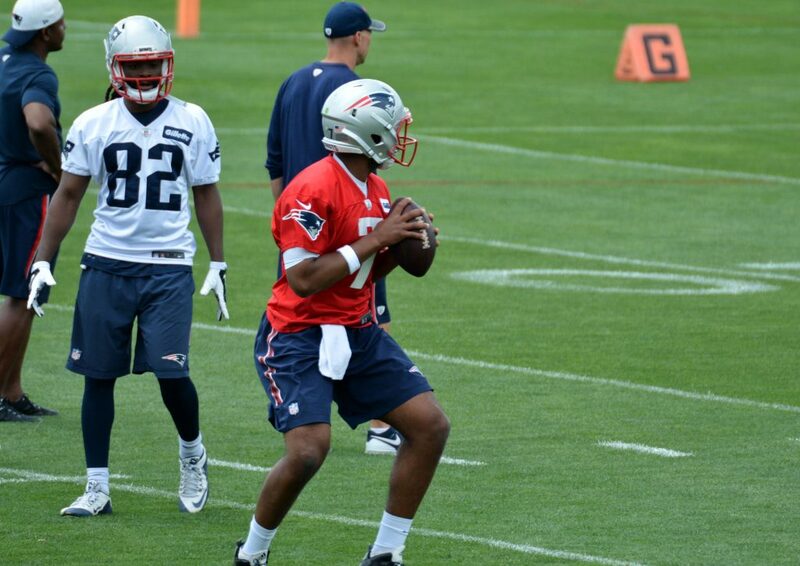 Quarterback Jacoby Brissett: My, my how quickly things can change in the NFL. Less than a week ago, all of the talk was on how would Garoppolo handle the success he had in Week 1 and would he be able to duplicate it. Now he’s injured and the rookie from NC State is thrust into the spotlight for the first time. He’s big, strong and athletic, things the Patriots liked about him when they scouted him during the draft process this spring. They took him in the 3rd Round of the draft with the 91st overall pick. He can scramble out of the pocket and can throw the ball down the field with ease. His accuracy on his short-medium throws is inconsistent, something we witnessed first-hand during minicamp and training camp this summer. But what the Patriots like about him is his poise, his calm demeanor, and his smarts. With a very limited workload this summer, something that is not all that uncommon for 3rd string QBs, he’s gotten a crash course in running the offense on a short week. 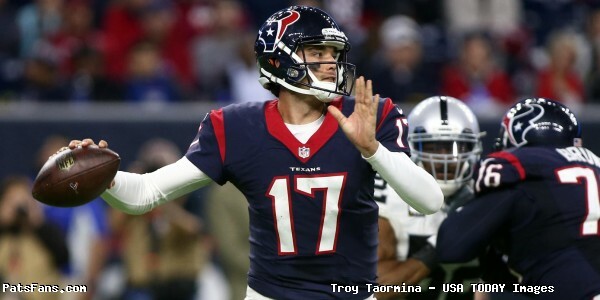 It will be a daunting task and the Texans will try to make life very difficult for him. One person who’ll be watching and rooting for the rookie will be former Patriots and Giants coach Bill Parcells. Parcells met Brissett in Florida and has been a mentor of sorts for the QB. Running Back LeGarrette Blount: One of the lightning rods for criticism among Patriots fans, Blount, or LG as he’s known among the players and coaches is off to a good start in 2016. He had a solid game in Arizona and followed that up with an impressive performance against Miami as the Patriots have leaned on their running game in Tom Brady’s absence. Right now he’s on pace for 1544 yards for the season. While maintaining those numbers is unrealistic, it is worth noting how he’s played into the coaches planning, this early in the 2016 season. Blount may be leaned on even more this week as with Brissett getting his first start. The coaches will want to ease the play calling for him by establishing the ground game while giving the rookie QB easier throws to complete. Obviously, Blount would be the big back to accomplish the first part of the equation. While the front seven for the Texans is stout, there are some runs to be had against this group. One key area to watch is, after carrying the ball 29 times on Sunday, how fresh will Blount’s legs be just four days later? Defensive End Jabaal Sheard: The Patriots defensive end opposite Chris Long has been quietly off to a decent start of the season. 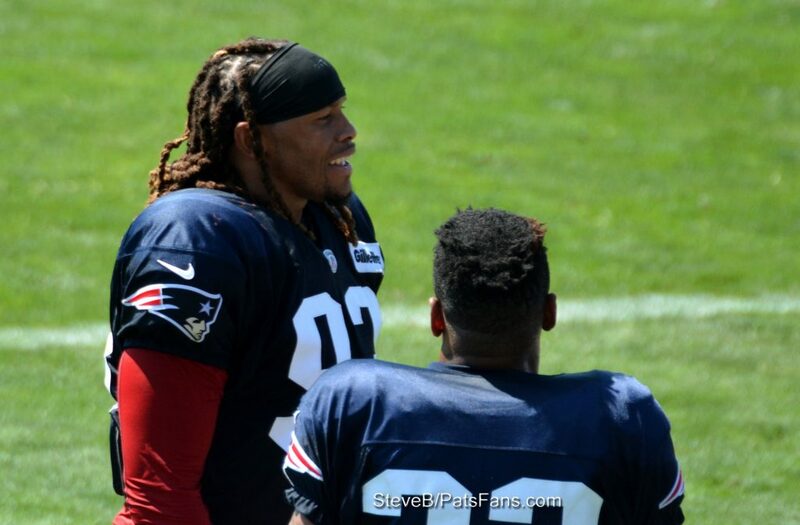 After missing the final few games of the preseason due to a knee injury, (MCL sprain) Sheard is rounding into form. He had four hurries and a QB hit on Sunday. Those hurries should be turning to sacks soon. When the two teams met in Week 14 a year ago, Sheard had a big game garnering two sacks and two forced fumbles. And he’ll line up on the edge against backup LT Chris Clark because Duane Brown is out with an injury. Clark himself is dinged up a bit with ankle and elbow injuries although he was listed as a full participant in the team’s injury report. In passing situation sub-packages, Sheard may kick inside and line up against left guard Xavier Su’a-Filo and center Greg Mancz. The Patriots will be leaning on their defense this week in an attempt to take the pressure off of their rookie QB. One way they can level the playing field is to have their front seven pressure the QB and possibly force a turnover or two and take away the deep passing game of the Texans. Sheard will be one of the key players to watch this week. Honorable Mentions: Chris Long on the other edge going against banged up (knee), RT Derek Newton. Cornerback Logan Ryan: After a particularly awful second half on Sunday against the Dolphins, the Patriots secondary is looking to rebound. And the Pats cornerback will be one of the key players to lead that turnaround this week. Ryan is likely to draw Houston’s best, most dangerous wide receiver in DeAndre Hopkins. A year ago, the Patriots put Ryan on Hopkins with either Devin McCourty or Duron Harmon as safety help over the top. They held him to a single catch but it was a 40 yarder down the sideline. Even so, that was still looked upon as a win for Ryan and the secondary after Hopkins had been lighting it up prior to that contest. But that was with the limited options Houston had at WR as well as their QB situation. They’ve upgraded both this year so it will be an intriguing chess match to see who rates the safety help as Will Fuller, the speedster from Notre Dame has been lighting it up as well. Ryan has been very solid for the Patriots and arguably their biggest ball hawk in the secondary. 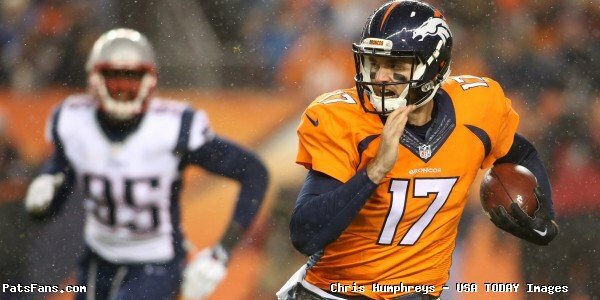 Osweiler has thrown three picks thus far, and Thursday night would be a great time for Ryan to add to that total. He’s going to have to be very good on Thursday night as Osweiler and the Houston coaches no doubt watched the tape of the Miami game and will be looking to challenge the Pats corners. Jamie Collins: Yes, another member of the defense has to step up this week, are we seeing a tendency here? For the Patriots to pull off the win here, as we’ve said, the defense is going to have to be the catalyst. We said that the first two weeks as well but it was the offense and not the defense that took the day. Collins has been good but not great the first two weeks of the season. He did get an interception last week when Chris Long pressure Ryan Tannehill and Collins was in perfect position to haul it in. This week, he’ll need to be better than good. With Lamar Miller in the running game and an offensive line that has struggled to provide good holes for him to run in, Collins must be that downhill, explosive type player that is blowing up plays at the line of scrimmage or the backfield. With Clark on the left side filling in for Brown, there will be some gaps that can be had for the blitzing Collins to influence things in a big way this week. The Texans don’t have a big tight end receiving threat. C.J. Fiedorowicz has caught just two passes for seven yards. Look for Collins to aid the pass rush this week. 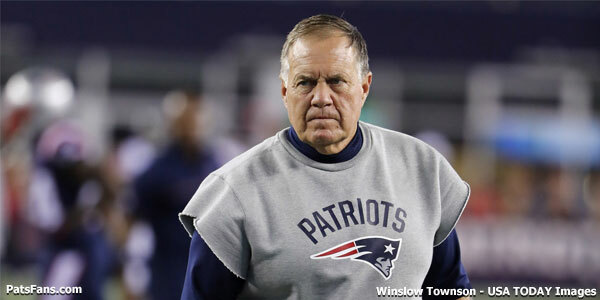 This entry was posted in Patriots Commentary, Patriots News and tagged 2016 NFL Season, 2016 Patriots season, Bill Belichick, Bill O'Brien, Brock Osweiler, Chris Hogan, Danny Amendola, DeAndre Hopkins, Dont'a Hightower, Houston Texans, Jabaal Sheard, Jacoby Brissett, Jamie Collins, Jimmy Garoppolo, JJ Watt, Julian Edelman, LaGarrette Blount, Logan Ryan, Malcolm Butler, New England Patriots, NFL, Patriots, Patriots edge rushers, Rob Gronkowski, Tom Brady, Trey Flowers, Will Fuller on September 22, 2016 by Steve Balestrieri. In this episode, we discussed the victory for the Pats against the Dolphins, and also previewed the upcoming game against the Texans. 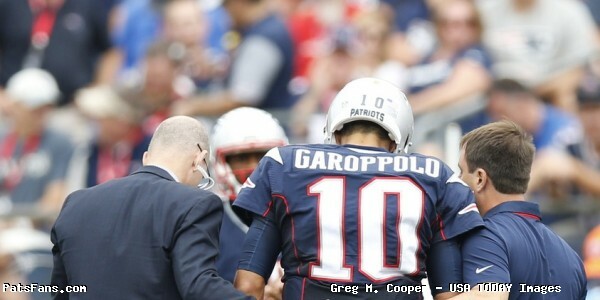 During the show, we also discussed the play of Jimmy Garoppolo and his injury during the last game. This entry was posted in Patriots Injuries, Patriots News, Patriots Podcast and tagged 2016 Patriots Roster, Bill Belichick, Brock Osweiler, Danny Amendola, DeAndre Hopkins, DeflateGate, Houston Texans, Jabaal Sheard, Jimmy Garoppolo, JJ Watt, Julian Edelman, LaGarrette Blount, Malcolm Butler, Miami Dolphins, New England Patriots, Rob Gronkowski, Tom Brady on September 21, 2016 by Russ Goldman.